The Nolachucky River is one of the most haunted places on this side of the mountains. 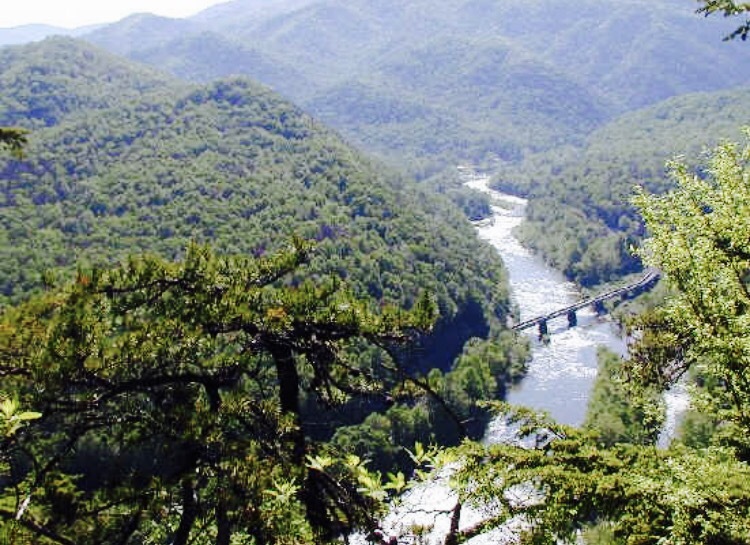 It is a 115-mile river that flows through Western North Carolina and East Tennessee, cutting its way through the mountains under the epithet of “Black Waters”. It pours from the mouth of Douglas Lake near White Pine. After that it weaves its way to the east and up, going across the North Carolina border; it ends when it meets with Cane River and and North Toe. Growing up, we were never allowed down to the river by ourselves. For many reasons, the main one being the waters. They are known to rise unexpectedly, the currents get stronger, and pull you in. A lot of folk and died there. One old man once heard a wailing down river. Thinking it was a wildcat he searched and searched up and down the banks of the river, looking to get a new pelt. But the wailing never got closer, nor farther. He finally gave up and went back to his cabin where his expecting wife awaited. He found her giving birth by herself, as there was no phone or neighbors for about a mile or so. The baby was born breech. The child and the mother died. It’s said the wailing was a banshee, known well by the Scotts and Irish who settled here. The banshee was often seen as “wailing over the dead” of those close to death. While they don’t bring death, they warn of it. Folk sayings prescribe to leave the banshee a good catching of fish, so her mouth will be too full to scream. Folks don’t like the thought of knowing when, ya know. Other stories involve lovers camping on the banks and being swept to their death by the unknown rising of the waters. There’s been fishermen who misjudged a step in the waters and were consumed by the rapids, never seen nor heard from again. Fishermen have been seen fishing by the waters until they go to take their leave and walk into the waters and vanish. That’s when folks know it was a spirit. Down stream on the Nolachucky, outside of Erwin, is the Devil’s Looking Glass. 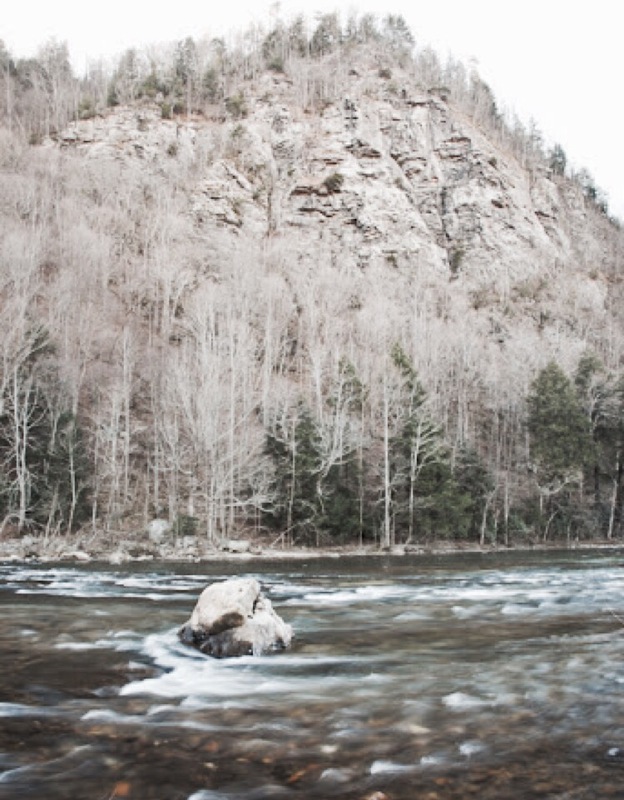 It is a sheer rock-wall rising hundreds of feet over the river in Unicoi County, Tennessee. This is where the majority of the deaths have concentrated over hundreds of years. Earliest story told by living memory is of a Cherokee woman, who jumped from the cliff and fell to her death in the waters. She had lost her lover in one of the Indian wars. Wailing as she fell, folks can still hear her wailing and sometimes body hit the waters. Her spirit is said to haunt the base of the wall, sometimes in the early foggy morning, keening for her lost love. An old witchy woman, Ole Miz Wilson, had a cabin near the base of the cliff. Folks said the spirits would come to her at night and she would entertain them with spells and incantations, which ended when the morning sun sent the spirits back home in the rocks. The Yuchi and Cherokee Indians avoided the Looking Glass out of fear of the images in the rocks. Cries of agony can be heard coming from the rocks themselves on some mornings, most often in the fall. Along the banks of the Nolachucky, hoofbeats can be heard on moonlit nights through the brushes and rocks of the river. Some folk have proposed it’s a hunter riding a horse, but all folks ever seen was a glimpse of a shadow. You’d hear the beats in the distance. They’d get closer and closer until they were right up on you, and then it would pass going the other way. You’ll never see anyone. Some devised to catch the person on the horse, to figure who is was that was scaring people. They camped on the banks and tied a rope to a tree by the water and stood with rope in hand about 30 feet inland. The hoofbeats got closer and closer. They couldn’t understand how a horse was going so well with so many rocks and obstacles in its path. They weren’t seeing it, but soon the beats were right on them and a force pulled at the rope and slung them off their feet. The beats continued in the other direction, unhindered. They investigated the ground and found prints in the mud. They figured “ghost don’t leave no prints so this was somebody”. Only problem was, the prints weren’t round like a horses. They were smaller and cloven like a goat’s. They quickly ran back home, pondering it was the Devil himself running along the banks. No one dared figure that out again. Pairing with this, folks say that in the early morning, when it’s real foggy out, you can see the Devil himself shaving in the Looking Glass. And he’ll see you, and laugh. This is the reason behind the rivers title as Devil’s Run. Most folk don’t dare to go down there for anything, even their works. But in real hard times, some do go, to get the water or mud. Only use for this is banework. Real bad stuff. And you don’t wana be caught there on the banks alone, lest you be making yourself up for a race with the Devil for your soul. Folks say there’s always one winner, who always wins. Loved this. My hometown. 🙂 We always took this back route to get to Highway 107 to reach Greenville. When I was little, my grandparents used to tell me there were Indian caves high up in the sheer rock face of the Devil’s Looking Glass. And of course, it’s always been said that it was haunted, along with that curvy stretch of road. I still get the willies when I go that way and I can see the river just a few yards from the black top. 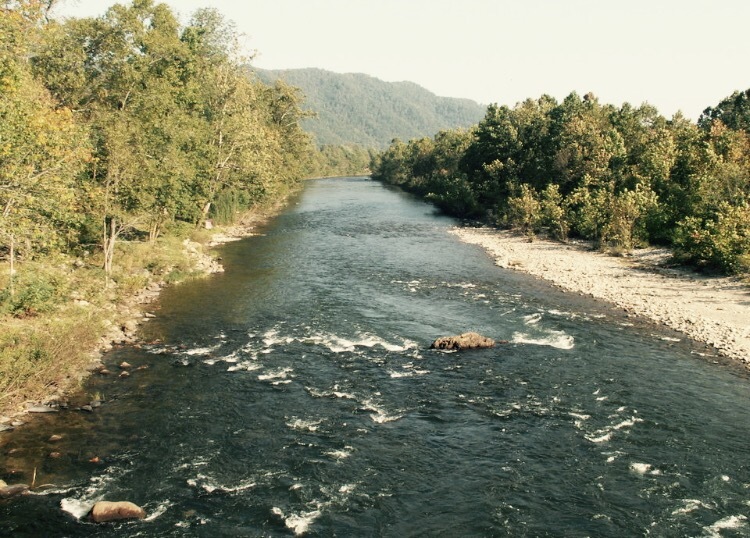 That old river has taken a lot of souls over the years.